Colombian police have discovered 12 tonnes of cocaine in the largest single drug seizure in the country's history. The drugs were found buried in four banana plantations in the north of the country, close to the routes used to smuggle cocaine to the US. President Juan Manuel Santos said it was the largest drugs haul in a single police operation. The operation is part of an offensive against the powerful Gulf Clan, a drug trafficking gang. Police said the drug stash belonged to Dairo Úsuga, also known as Otoniel, leader of the Gulf Clan, one of Colombia's most dangerous criminal organisations. The security forces have been trying to capture Otoniel for years. Police said they had also arrested four people and estimated that the value of the haul was around $360m (£275m). 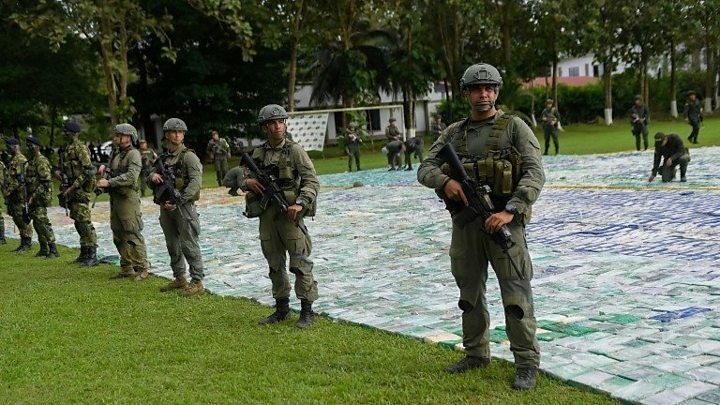 In the last two months the security forces have seized 20 tonnes of cocaine in Antioquia. In September, Otoniel told the government he wanted to turn himself in.